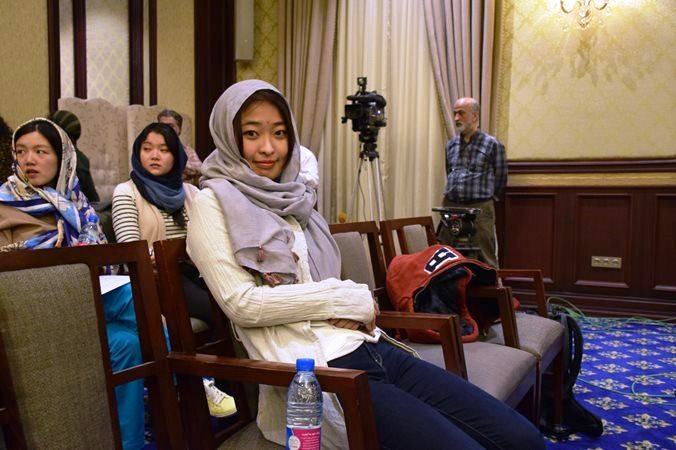 The 2017 FIDE Women’s World Championship was officially declared open in Tehran today, with top seed Ju Wenjun picking the white pieces in tomorrow’s first round. 63 players are competing in a 6-round, 20-day knockout that will determine a new Women’s World Champion. Hou Yifan chose not to play and will not be lying in wait for the winner this time, since she also withdrew from the 2015-6 Women’s Grand Prix won by Ju Wenjun. The format is the same 64-player knockout as for the events won by Anna Ushenina in 2012 and Mariya Muzychuk in 2015. There are five rounds with 2-game mini-matches followed by a 4-game final, with tiebreaks on the following day if required i.e. There is only one full rest day on 26th February, before the final, though if players win their matches without the need for tiebreaks they’ll have a day to rest between rounds. The prize fund is $450,000, with the new World Champion picking up $60,000, the runner-up $30,000 and first-round losers also taking home $3,750. The new Women’s World Champion is expected to play a 10-game World Championship match against the FIDE Women’s Grand Prix winner Ju Wenjun, while if Ju Wenjun wins the knockout she’ll play Grand Prix runner-up Humpy Koneru. The event features former World Champions Zhu Chen, Antoaneta Stefanova, Alexandra Kosteniuk and Anna Ushenina as well as a host of top female players, but the run-up to the tournament has not been without controversy. The Women’s World Championship was originally supposed to take place in late 2016, but with no bidders a decision was taken at the 2016 Olympiad in Baku to hold the event in Tehran in 2017. On the one hand that was normal, since chess has been experiencing a boom in Iran, but for a women’s event it also meant a number of issues. Female players would be required to wear hijabs, while interaction with male coaches could also contravene local laws. As for the World Championship in Iran, I decided not to take part, as it’s absolutely obvious that Iran isn’t a suitable country for such a prestigious event. And it’s incorrect that those chess players who refuse to travel to Iran and wear the hijab simply lose the right to play for the World Championship for nothing. My sister, Anna, signed the contract. We talked about it, but for her becoming World Champion is a lifelong dream. Argentinian no. 1 Carolina Lujan also turned down the chance to play in very similar terms, while American players faced the problem of travel to Iran also being discouraged by their government, even before Donald Trump’s attempted “Muslim ban” muddied the waters still further. Irina Krush dropped out, as did US Women’s Champion Nazi Paikidze, whose protest gained wide coverage in the mass media and saw almost 17,000 sign a protest to “Stop Women’s Oppression at the World Chess Championship by Challenging FIDE’s Decision”. This is going to be the biggest sporting event women in Iran have ever seen; we haven’t been able to host any world championship in other sporting fields for women in the past. It’s not right to call for a boycott. These games are important for women in Iran; it’s an opportunity for us to show our strength. Ultimately the decision to hold the event in Tehran remained unchanged, and players were left to decide whether or not to take part. One person whose decision didn’t depend on the reflections above, however, was current World Champion Hou Yifan. The Chinese player has long complained about the “lottery” of the knockout system and campaigned to instead implement the same system as in men’s chess where the World Champion competes only in the final match. Hou Yifan has now completely withdrawn from the World Championship cycle, meaning the chances of the winner in Tehran holding on to the title for more than a year will be much greater. The mini-matches are going to be intense, so be sure to tune in from 15:00 Tehran time (12:30 CET) on Saturday for the first games of Round 1.